For Oasis of the Seas, one of the world’s largest cruise ships, arriving to St. Thomas in the Caribbean can be daunting. With narrow water ways, sailboats anchored in the harbor, a tight turn and just six feet of clearance below the keel, the water around this popular port is one of the most difficult to maneuver. But thanks to an expert marine team using the industry’s leading technology, arriving is just another day at the office for the Oasis of the Seas crew. With a local pilot offering his expertise on the currents and local marine environment, and powerful bow thrusters which gives the captain the control he needs to pull the 1,187-foot ship, this is nothing but smooth sailing. Royal Caribbean and members of St. Thomas' government met yesterday to officially re-open Magens Bay in St. Thomas, which had suffered from significant hurricane damage. 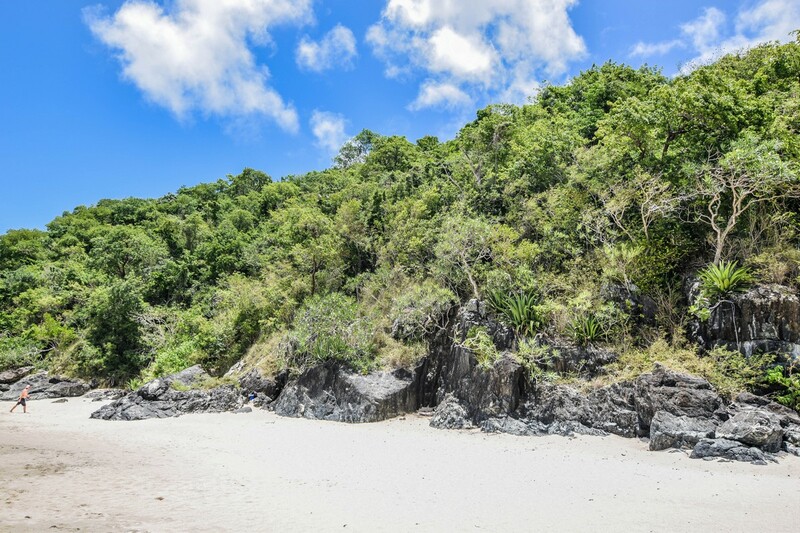 Royal Caribbean International partnered with the Department of Tourism, the Department of Planning and Natural Resources, the Magens Bay Authority and other government agencies and businesses to restore the world-renowned beach. The Category 5 hurricanes caused major damage to the beach facilities, including the restrooms and food and beverage concession and gift shop. Winds and storm surge also caused significant beach erosion and impacted trees and plants along the shoreline. Cleanup crews have been working daily since the hurricanes to remove fallen trees and debris, repair buildings, and replant hundreds of native plants and trees. About 530 new trees have been planted, and 470 trees have been pruned. 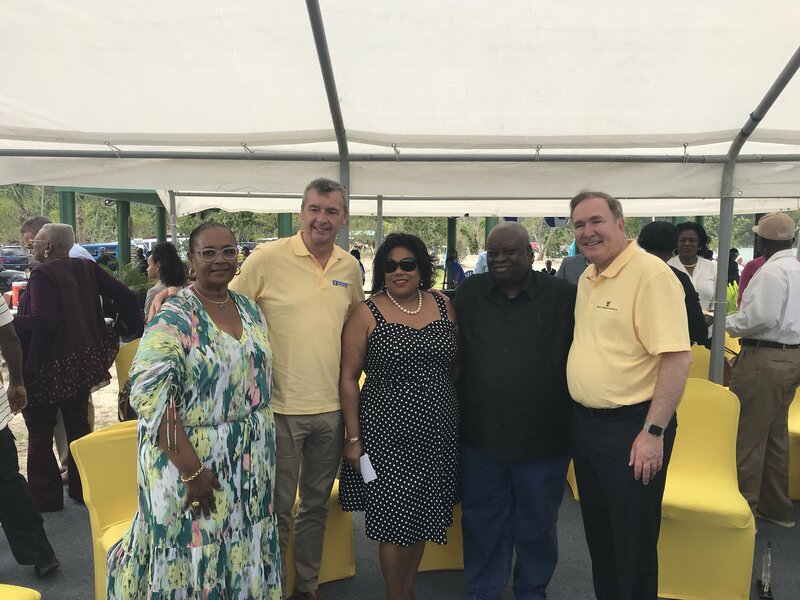 The ceremony included the reopening and dedication of Magens Bay, with St. Thomas, Governor Kenneth Mapp and Royal Caribbean Cruises Ltd. Chairman and CEO Richard Fain and Royal Caribbean International CEO Michael Bayley present. Mr. Fain shared that Royal Caribbean was keen to make a contribution to help the Virgin Islands and its people. He reported that tens of thousands of cruise passengers have visited St. Thomas since the storms and Royal Caribbean’s visitor satisfaction ratings were now higher than before Hurricanes Irma and Maria came ashore. Thursday’s ceremony was particularly significant, Mr. Fain noted, because it was 47 years and one month to the day that Royal Caribbean’s first ship made its first voyage, calling on St. Thomas. "This has been a long and important relationship," Mr. Fain said, adding, "It’s very much a partnership." Mr. Fain thanked the team at Royal Caribbean who took pride in the revitalization of Magens Bay. “I think they would all join me in expressing our admiration for the people here in St. Thomas for undertaking all of the work that’s going on and for handling it with such aplomb and with such a commitment to make it better,” he said. Royal Caribbean announced today it will resume calls to St. Thomas on November 10, following weeks of skipping the island due to hurricane damage. Adventure of the Seas will mark Royal Caribbean's return to the island. She will be the first Royal Caribbean ship since early September to visit St. Thomas, which was impacted by hurricanes last month. In partnership with the government of the U.S. Virgin Islands, Royal Caribbean also has committed to undertaking the complete restoration of Magens Bay, one of St. Thomas’ most popular tourist attractions – with plans for a grand re-opening of the pristine destination during Adventure of the Seas’ visit on Nov. 10. With power and water to the island fully restored and most downtown shops, restaurants and bars and tour operators fully operational, guests will be able to experience a diverse and extensive array of dining, shopping and activities. “We are very excited to get back home to our friends in St. Thomas. The Caribbean is our family, having cruised there for nearly 50 years, and the long-standing relationships created in all this time are unwavering,” said Michael Bayley, President and CEO, Royal Caribbean International. “We are committed to doing everything we can to help and proud to support the restoration of the iconic Magens Bay." In addition, Royal Caribbean is planning a return to San Juan, Puerto Rico and St. Maarten by the end of November and is working closely with local governments to announce the exact dates. By December 1, all scheduled calls to the three islands will operate as planned. Many Royal Caribbean cruises make a stop in St. Thomas while on an Eastern Caribbean itinerary, but the nearby island of St. John is an enticing and exotic destination cruisers should consider in their shore excursion plans. St. John is just a few miles away by ferry from St. Thomas, making it an easy commute between the two islands. 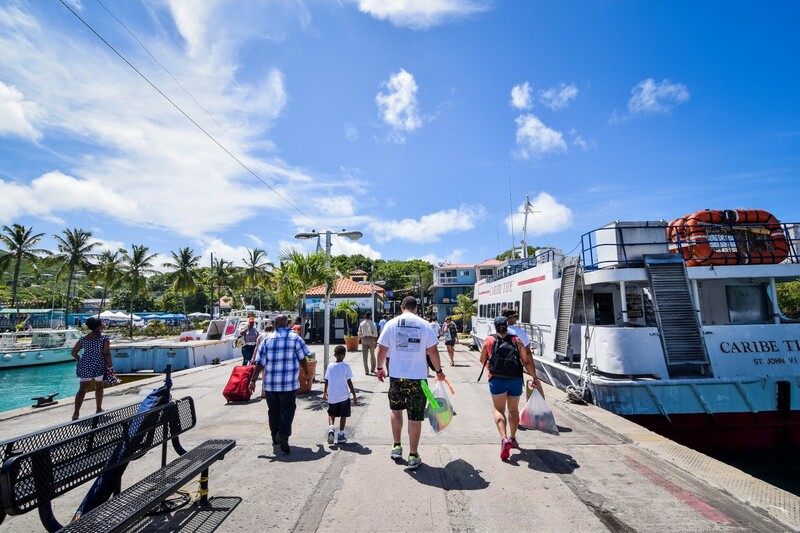 Regular ferry service means getting back and forth is a mere formality and that means the pristine beaches of St. John are easily accessible. On a recent Royal Caribbean cruise, we decided to try a visit to St. John and the good news is it is a great option to consider, especially for those that may feel St. Thomas is a "been there, done that" situation. St. John is the smallest and least populated island in the U.S. Virgin Islands. It tends to be a refuge for cruise visitors and local residents alike, who seek a place to "get away from it all." 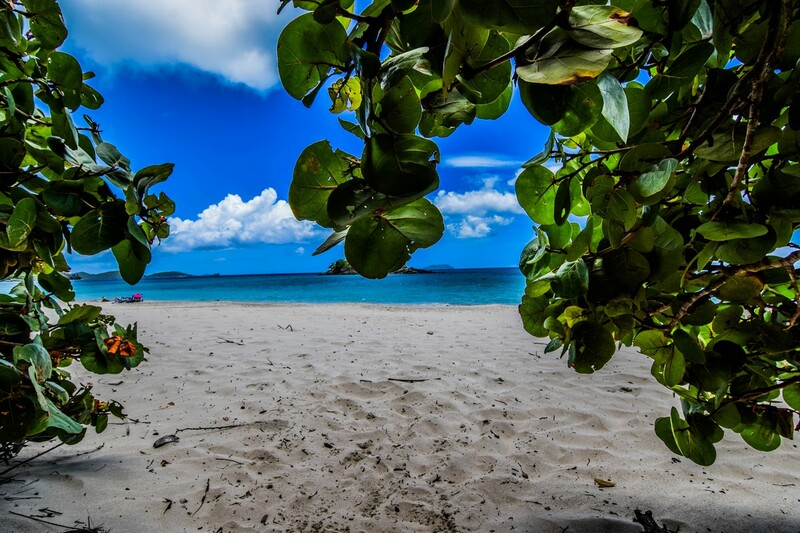 The Virgin Islands National Park takes up roughly two thirds of the island, which means visiting St. John is really about taking time to enjoy a beach, nature hike or combination of the two. The beaches of St. John offer plenty of sun and surf, along with the typical beach activities like snorkeling, kayaking and paddle boarding. 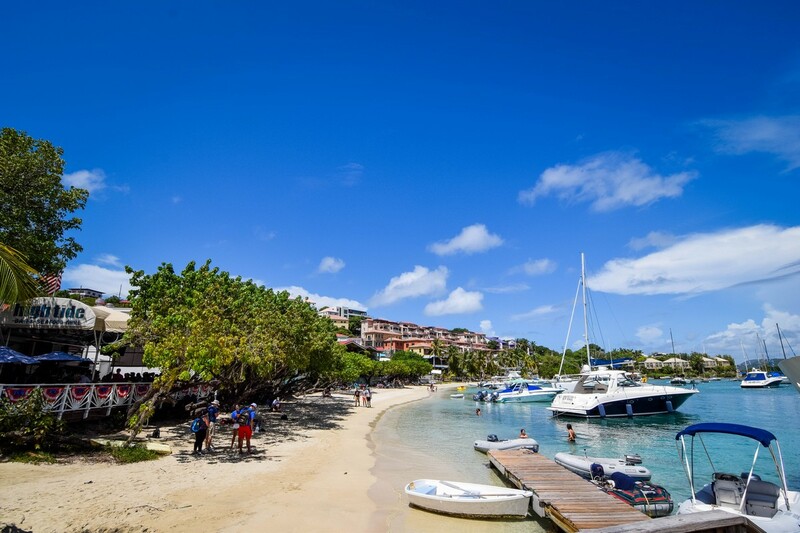 There is a small town where visitors arrive via ferry, Cruz Bay. This town has some basic offerings, such as restaurants, bars and some shopping. However, unlike St. Thomas or St. Croix, the offerings in Cruz Bay are limited. Essentially, people come to St. John for the natural beauty. There are two primary means of getting from your Royal Caribbean cruise ship to St. John. Both have their advantages and disadvantages, and which option you pick depends on your personal preference. Royal Caribbean offers a few excursions to St. John that will depart from near the cruise ship and take you directly to St. John. 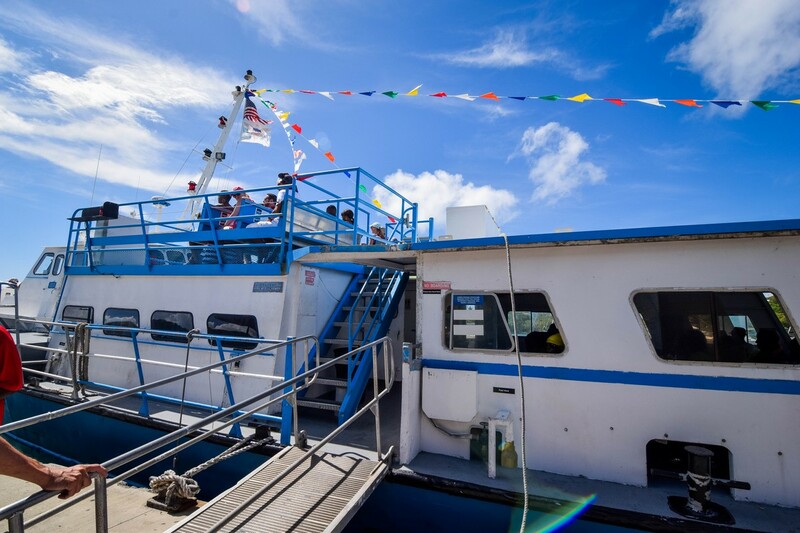 There are tours that will provide round-trip ferry transportation, as well as some sort of an organized tour while in St. John. In addition, there is also a "on your own" St. John excursion that brings you just to the island and lets you go on your own. The primary consideration with the Royal Caribbean excursions to St. John is the fact you will take a longer ferry ride. The ferry from Crown Bay is roughly 40 minutes in length, which is about double that of the other ferry. Of course, booking with Royal Caribbean has an added bonus of the guarantee of return, where you know you will absolutely get back to the ship, no matter what. For many, that peace of mind is important. 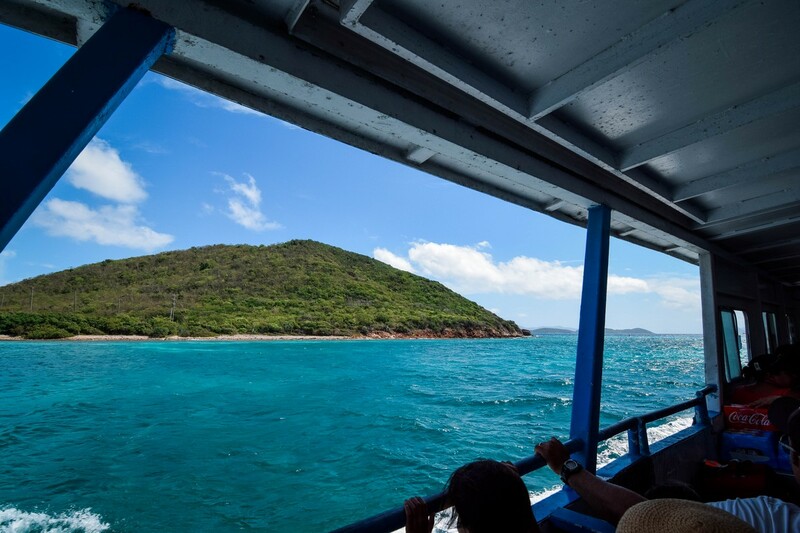 Many residents of the U.S. Virgin Islands regularly go back and forth between St. John and St. Thomas, which means there is regular ferry service offered for a small fee. There are two primary points of taking a ferry to St. John: Crown Bay and Red Hook. The Crown Bay ferry is the same ferry Royal Caribbean excursions take. The benefit is this ferry departs and returns very close to the cruise ship, which means taking a taxi is either unnecessary or significantly cheaper. Of course, the ferry ride is about double the length and there are less ferries offered throughout the day. Red Hook is an area on the east end of St. Thomas, with a short 15-20 minute ferry ride to St. John. While it requires a taxi ride to reach Red Hook, we felt the shorter and more frequently offered ferry rides were worth it. Ferry service from Red Hook runs every hour, on the hour. You can consult the ferry website for exact fare and schedules. The taxi ride to Red Hook is fairly short as well, although often you will get lumped into vans other other guests, where the driver makes a few stops along the way. Your experience will vary, but the one way trip should take about 30 minutes (if not less). Once at the ferry terminal, you can purchase round trip fare. Be sure to bring plenty of cash, because taxis and the ferry regularly take cash only. If you are wondering how long it takes to get from Crown Bay to Red Hook and then take the ferry to St. John, it depends largely on timing. How long it takes you to get into a taxi, for the taxi to drop you off and what time you arrive before a ferry departs are all factors you may not have a lot of control over. If you time things out perfectly, it should take just around an hour. If you just miss the ferry, figure another an extra 30-60 minutes on top of that estimate. The ferry will drop you off in Cruz Bay, which is on the west end of the island. 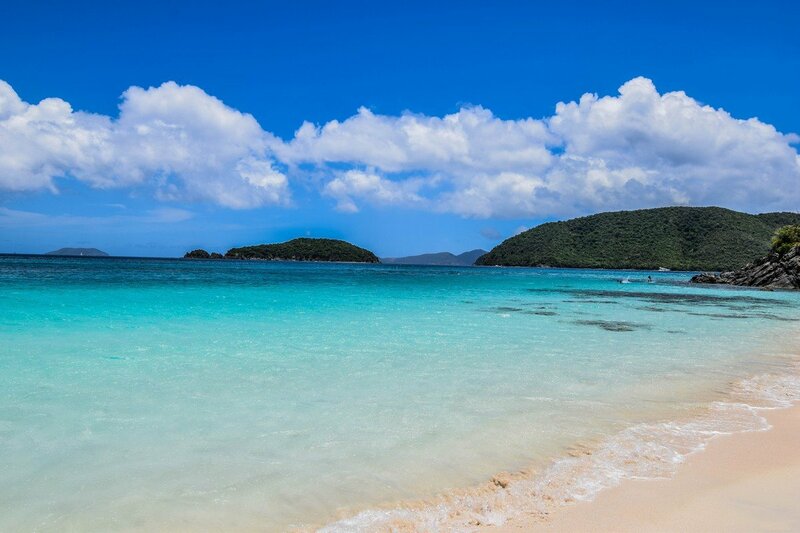 There are a few shops and restaurants, but the real attraction of going to St. John is to see the beaches. You ought to be able to take a taxi to any of the beaches nearby. 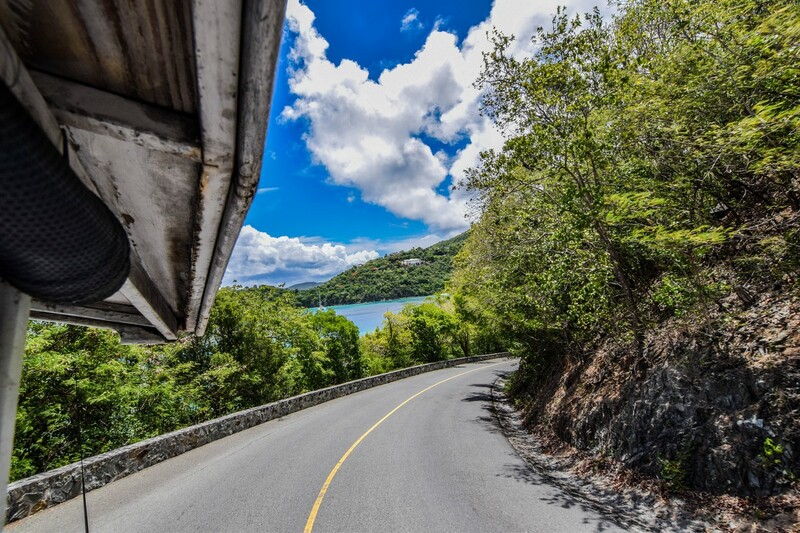 There is a primary road, North Shore Road, that runs along the Northwest coast of St. John and has easy access to the beaches. Most day visitors opt for taxis, but you could also rent a car. Keep in mind that vehicles drive on the left side of the road in St. John. 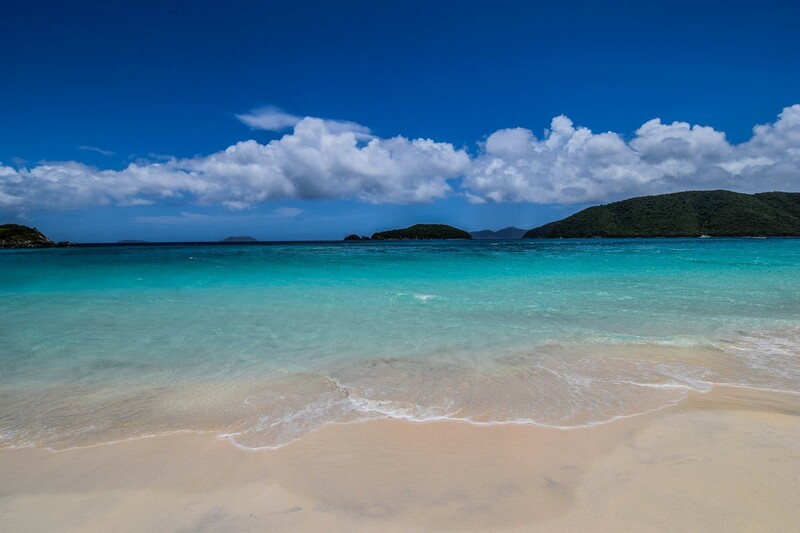 St. John is largely set up as a National Park, and that means lots of beaches to consider. By far the most popular is Trunk Bay, which is about a 10 minute taxi ride away. 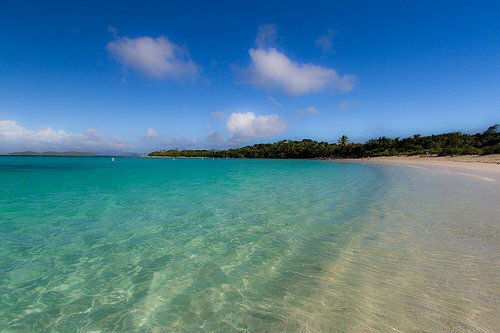 There are lots of other beaches, including Cinnamon Bay Beach. We chose Cinnamon Bay Beach for the lack of crowds. 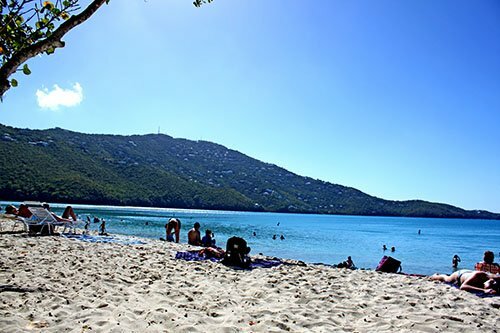 For the purposes of this blog post, we will be discussing Cinnamon Bay Beach, but the experience of visiting any of the beaches in St. John is likely very similar: a beautiful and scenic coastline with white sand and clear, turquoise waters. 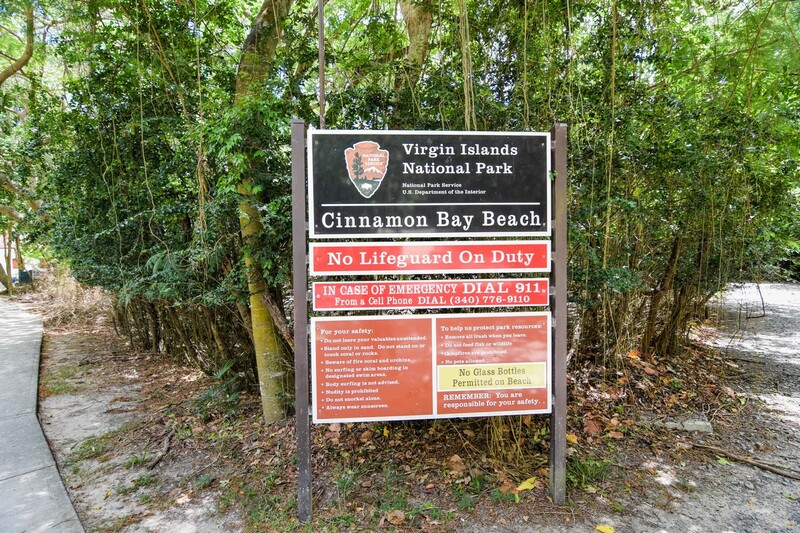 At Cinnamon Bay Beach, there is no beach fee, so feel free to grab any spot you choose. We were able to rent beach chairs from a company that offers surf rentals as well. There is not a lot of natural shade, but if you retreat to the back edge of the back, there was some shade provided by trees and shrubs. Most of the taxis in St. John make regular stops at each of the beaches, so getting a taxi back is fairly simple and just a matter of timing. If you are a United States resident, your cell phone will likely work normally in St. John because the island is part of the United States. We found cell phone coverage to be a "light" the further away from Cruz Bay and the main road you get, but placing phone calls (like to a taxi driver) usually works. Have you visited St. John? What did you think of the experience? If you have visited other Caribbean islands, how do you think St. John compared to those? Any tips of your own to add about visiting St. John? Any questions? Hearing from readers is part of the fun (and is helpful to others), so please share your thoughts in the comments below! Royal Caribbean has canceled to scheduled stops in St. Thomas due to an approaching tropical storm. Concerns over a tropical disturbance in the eastern Atlantic Ocean, Invest 99-L, which may develop into a tropical depression or storm in the days ahead, forced Royal Caribbean to make the change, according to Virgin Islands Port Authority Executive Director Carlton Dowe. St. Thomas Source is reporting Oasis of the Seas was scheduled to visit Crown Bay on August 23 and the Freedom of the Seas was scheduled for August 24. According to guests onboard, Oasis of the Seas will skip both St. Thomas and St. Kitts, and instead visit San Juan on August 23 from 1:30pm to 11:30pm, then have a sea day, and then visit Labadee from 8am to 4:30pm. Freedom of the Seas will skip both St. Thomas and St. Martin and instead be at sea on August 23, then stop at Costa Maya, Mexico on August 24, Cozumel, Mexico on August 25, and then spend the remaining days at sea before returning back to Port Canaveral on August 28. Many Royal Caribbean ships make stops in a little piece of paradise that just so happens to be part of the United States, St. Thomas. Known as "the gateway island" of the U.S. Virgin Islands in the Caribbean, St. Thomas is known for its beaches, snorkeling and sportfishing. Frankly, there is a lot to see and do in St. Thomas, with the island's capital, Charlotte Amalie, being a busy cruise ship port with high-end restaurants and shopping. The First European settlement on St. Thomas consisted of four taverns. Now known as Charlotte Amalie, today it is a haven for shoppers, but was once a pirate sanctuary. Legitimate trade gained popularity in the 1700s when it was declared a free port, making it the trading center of the West Indies. More than 1.7 million cruise ship guests visited here last year to enjoy the duty-free shops, historic attractions, pristine beaches and friendly locals. Royal Caribbean ships dock at Crown Bay or at the West Indian Dock, approximately 1 1/2 miles from downtown Charlotte Amalie. Regardless of what you choose to do, there is a lot of great choices for things to do in St. Thomas. If you have ever heard of St. Thomas, you probably also heard someone mention Magens Bay, and for good reason. 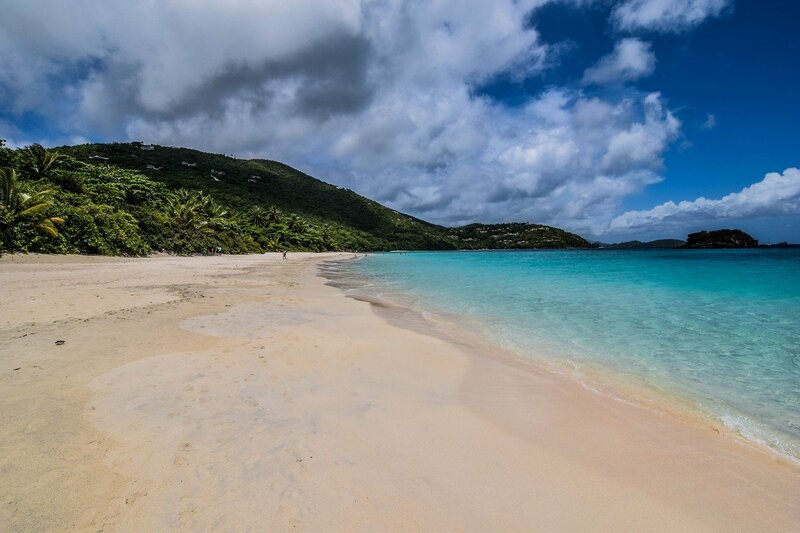 Magens Bay is known for its turquoise waters and pristine sands that make for a picturesque beach getaway. 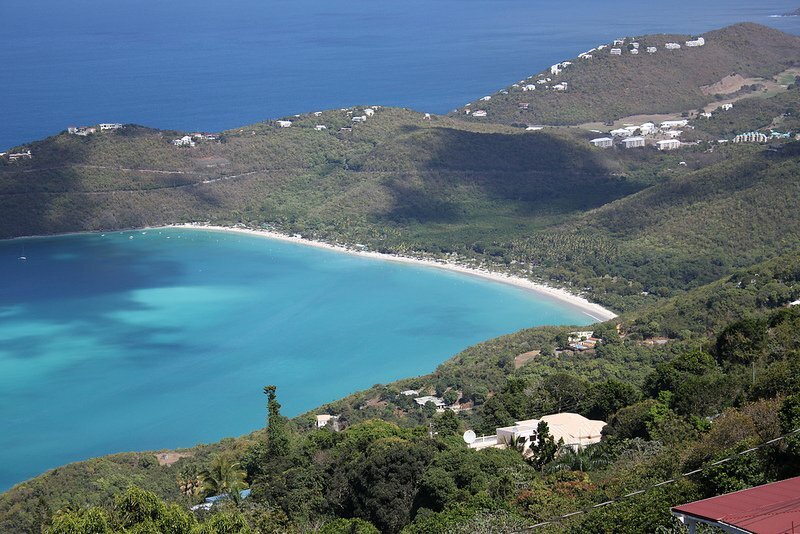 Magen's Bay Beach is considered one of the world's most beautiful. Arguably, this is the best thing to do in St. Thomas on a cruise. Once at Magens Bay, you have the choice to swim or snorkel in this gorgeous, balmy, palm-lined, turquoise bay situated along St. Thomas' coast simply enjoy the beach. Getting to Magens Bay is fairly easy, with organized shore excursions and taxis readily available to bring guests to this idealic beach. Most excursions through Royal Caribbean include stops along the way at scenic overlooks and other places of historic significance. The beach has a small fee for admission, so the bulk of the cost to get to Magens Bay will be in transportation back and forth. If you want a good alternative beach that is a heck of a lot closer to Charlotte Amalie, try Emerald Beach. ​If exploring the island's capital is more your fancy, you will find a wealth of great shopping and dining choices in Charlotte Amalie. 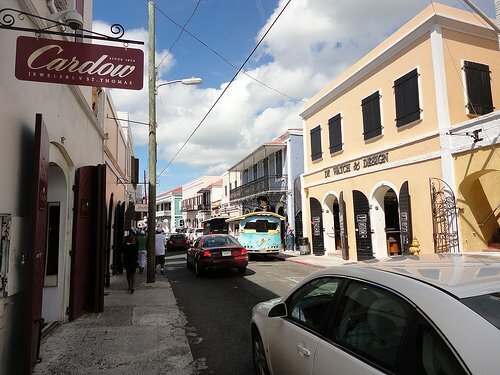 Charlotte Amalie’s downtown and shopping area is a short taxi ride from the dock – $4 per person each way from Crown Bay or $4 per person each way from the West Indian Dock. Want to take a beautiful walk? Take a 30 minute walk to town from Havensight Mall. Be sure to wear comfortable shoes. If you are going to see the Caribbean island of St. Thomas, why not see it from over 700 feet above sea level? The Skyride to Paradise Point allows guests to go to the top of a mountain and enjoy a stunning view of the island. Guests embark on a panoramic gondola ride to mountaintop Paradise Point, where they can seer excellent views of the city and dazzling waters below. Once at the top, you have the choice to shop for souvenirs, engage in live bird shows, or savor a tasty lunch in a local café. Getting to the skyride and up the mountain is pretty simple and the only caveat worth mentioning is there are a lot of stairs involved, so if you have a stroller or wheelchair, keep in mind that there is no alternative to the stairs. Interestingly enough, it is cheaper to purchase this excursion through Royal Caribbean than going to the tram directly and you can do the skyride at your leisure, since it is continuously operating throughout the day. St. Thomas is a beautiful island, but its neighbor St. John is equally beautifully and far more pristine. Many Royal Caribbean veterans opt to take the ferry to the nearby island paradise for a taste of something a little different. All you have to do is hop on the ferry from Charlotte Amalie the provides an excellent opportunity to check out the spectacular coastal scenery and soothing breezes. Given a ferry is involved in getting to and from St. Johns, we prefer to book shore excursions with Royal Caribbean when visiting St. John for the peace of mind associated with not missing the shop upon returning to St. Thomas. For those that want a little nature in their visit to St. Thomas, check out Coral World Ocean Park, were you can see tons of marline life without ever getting wet. At Coral World, you will encounter a variety of marine life including sharks, stingrays, turtles and more. Coral World boasts the opportunity to see a recreated living reef and 21 aquariums in Marine Gardens.You can even pet, snuggle and take photos with sea lions or try a Sea Trek Helmet Dive. Visit the shark pool where you can pet a shark or hand feed a stingray. Visit with the Lorikeets which will flock to your arm when offered a cup of nectar. 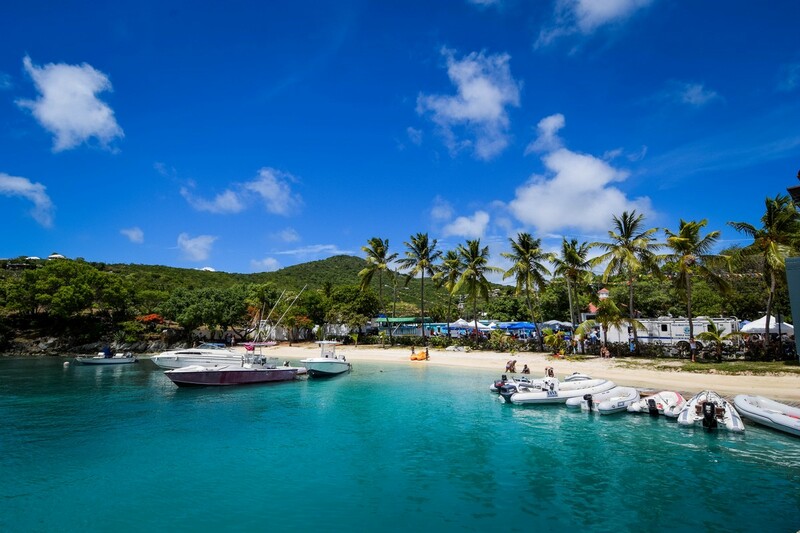 Many guests opt to combine Coral World with a stop in Magens Bay, since the two are close by each other and offer the opportunity to experience both in one stop. Since there is so much to see in St. Thomas, a lot of times a tour of the island makes a lot of sense. Taking a tour of St. Thomas allows you to get a "taste" of the highlights and maybe set yourself up for something on a future visit. There are a lot of tours you can take, either on your own, with a private driver or through a group tour. Each has its own benefits and drawbacks, and one of the big factors will be cost. Group tours will be the least expensive options, but you will be at the mercy of the pace of the group. Conversely, a private tour will allow you to do what you want, when you want, but with the caveat that you will pay more for it. Island tours are very popular shore excursions and available through third parties or with Royal Caribbean. When choosing, it is worth noting that traffic on the island can be an issue in the later afternoon, so getting back to the ship on time should be factored into your plans. Of course, Royal Caribbean shore excursions promise the ship will wait for you. A lot of the island tours will visit popular spots like Mountain Top, Drake's Seat, Bluebeard's Castle and more. Have you tried any of the places we outlined? Do you have a recommendation for something to do in St. Thomas? Share your thoughts or questions in the comments below! Most Royal Caribbean guests looking for a shore excursion in St. Thomas are likely to consider something at the beach and for good reason. St. Thomas has a reputation for having some of the best beaches, including the world famous Magens Bay. On our recent visit to St. Thomas, we tried a different beach that was much closer to the cruise ships at Emerald Beach. Some background is necessary for understanding why one would want to consider a lesser known beach, like Emerald Beach. We had been to Magens Bay many times and while beautiful, it requires a long taxi ride across the interior of St. Thomas to reach there and then a modest entrance fee. We endeavored to return to Magens Bay until our taxi driver pointed out two basic facts: almost any beach in St. Thomas is beautiful and there are beautiful beaches closer and for less money. Enter, Emerald Beach, which is located just a few minutes drive from Charlotte Amalie. Emerald Beach is a public beach that anyone can access, although there is a hotel that is located near the beach as well. Despite the hotel, anyone can use the beach. There is an outdoor bar and restaurant at the Best Western that anyone can go to to get drinks or food. As our taxi driver promised, Emerald Beach is indeed quite beautiful and certainly a lot less crowded than what we have experienced on previous visits to Magens Bay. If you want to be really picky about the details, Magens Bay is situated in a lush tropical valley, whereas Emerald Beach has a hotel behind it and the airport is across the street. I would not characterize either as a problem, but it is worth noting. Emerald Beach is a good choice for anyone looking for a quiet(er) beach experience with less crowds and/or a closer drive. At five minutes from Charlotte Amalie, it is a really quick ride. The premise of the Skyride is simple, take a cable car from the base of the mountain all the way up the hillside in just minutes. Located within walking distance from the Havensight Pier, the Skyride is a 5-10 minute walk. No taxis or transportation needed, it is easily accessed. There are no set times for this excursion. Guests may purchase tickets from the ship's Shore Excursion Desk or purchase tickets at the attraction. If you bought tickets on your Royal Caribbean ship, you can exchange your tickets for wristbands at the ticket office. Admission to the Skyride is good for the entire day, so you may return later on and experience it again. Once you have your wristbands, guests will walk up a set of stairs to the loading area. Guests will be lined up in the order they arrived to board the next available cable car to the top. The cable cars can hold about 6-8 people and there are windows on all sides to allow a view on the way up. The ride itself takes roughly five minutes and is fairly tame. There is little in the way of swaying or motion and the ride is quite smooth. Once at the top of Paradise Point, guests disembark the cable car and can walk to a number of platforms to enjoy the view. In addition to the view of the harbor, Paradise Point features shops, a nature trail, a restaurant and a bar. Guests may return down to the bottom at any time. 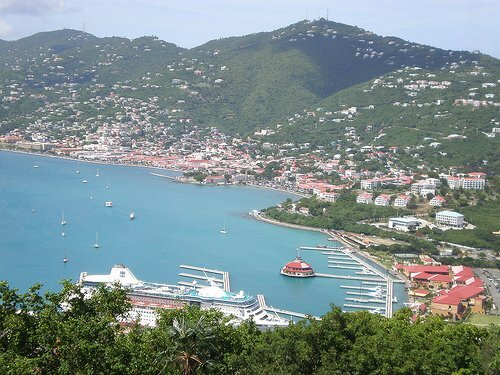 There is no question that the skyride offers some fantastic views of the harbor, Charlotte Amalie and the surrounding area. It is the perfect perspective to see your Royal Caribbean ship in the harbor. Once at the top, the view is impressive and it makes for great photos. The Paradise Point folks advertise a Carnival show everyday, although we were not present for it on our stop. The shops and bar at the top are your typical tourist-centric diversions and we opted not to go there. If you have never done the skyride, it is an impressive attraction that can be completed fairly quickly. You should have plenty of time to do other activities on St. Thomas even after experiencing the Skyride. Royal Caribbean also advertises that the excursion is risk free, so if you purchase a ticket at the Shore Excursion Desk and then decide not to go for whatever reason, you may return the unused ticket to the Shore Excursions Desk onboard for a full refund. 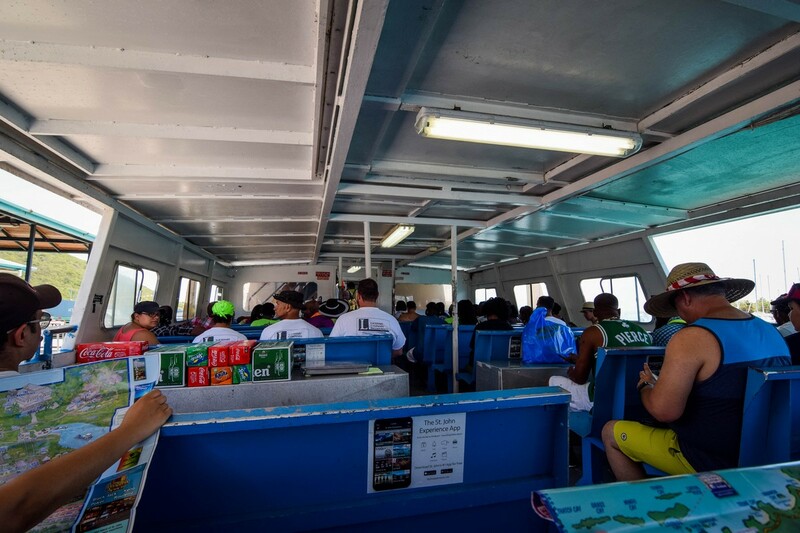 The St. Thomas Skyride has a tremendous capacity and the benefit of a full refund is reason enough to purchase tickets in advance either on Royal Caribbean's web site, or at the Excursion Desk on board your ship. Cost: $21.75 per adult, $10.75 for kids. As part of my next Royal Caribbean cruise, I want to take you along for the planning process as we make decisions and plan our Royal Caribbean vacation. I hope this will give you some insight into my thought process and perhaps this will assist you for planning your next Royal Caribbean cruise too. Today we are going to look at excursion ideas for one of the stops on our Freedom of the Seas 7-night cruise, St. Thomas. I've been to St. Thomas about four times now and I am struggling with what to do here. St. Thomas is quite beautiful and we have always done some sort of beach excursion. We may work in some shopping or a tour, but inevitably we end up at the beach. And that beach is always Magens Bay. The reason I am conflicted is because going to the beach is easy and works well for my family. It is low key and because I have two young kids (4 and 6 months), we cannot do something adventurous even if we wanted to. The other problem with finding new things to do in St. Thomas is I have come to the conclusion that a lot of the popular things to do in St. Thomas are tourist traps. On our last trip to St. Thomas, we did a group tour so that we could see more of the island and expand our horizons. I felt like we just went from one tourist spot to another, so while I am always looking for new ideas, I have resigned myself to the conclusion there may simply be no escaping the touristy nature of things to do there. After careful research, I cam up with these excursion ideas. Why mess with something that works, right? Magens Bay is beautiful and provides the kind of Caribbean beach experience most folks want when they go on a cruise. The cost to getting to the beach and the beach itself are minimal and there aren't a lot of big waves here either, which is good for my older daughter. The biggest negative I can say about Magens Bay is that we have been here before. Many times. While browsing Royal Caribbean's shore excursions, I ran across the Skyride and it sounds pretty interesting. Take a tram up 700 feet to mountaintop Paradise Point and enjoy the view. This will not be an all day excursion, but it sounds like a fun little thing to do in addition to something else on the island. On our last trip to St. Thomas, our tour brought us to a different peak (Mountain Top) and we had a great view there, so this would be similar but from a different perspective. Interestingly enough, everything I have read indicates it is cheaper to purchase this excursion through Royal Caribbean than going to the tram directly. It also seems like when you purchase a pass, it is good for anytime that day, so it gives us flexibility. Just like Magens Bay, Lindquist Beach is another beach option and the appeal here is it is not Magens Bay! Based on reviews and photos posted online, it looks quite beautiful as well. I will not waste more time waxing poetically about the virtues of a beautiful beach. The only negative I can think of is we might go here in spite of Magens Bay and then regret not going to Magens Bay if this beach does not feel as good as Magens Bay. It's been a number of years since I went to downtown Charlotte Amalie, St. Thomas' capital, and explore the city. In other ports, we usually enjoy wandering the streets and doing some shopping along with having lunch at a local spot. It is the kind of adventure I really enjoy. The problem with walking around Charlotte Amalie is it will be July in the Caribbean and walking around outside sounds like a recipe for being tired and sweaty, with a pinch of whiny kids. I could see us going here first in the morning to get some exploring in and then taking a cab to the beach to cool off. After considering our options, we ended up choosing.... the skyride and a beach. We are not sure which beach we will go to yet but we are going to keep things up in the air and make a decision closer to our day. The skyride does sound pretty neat and it is something new that we can try, so we will likely book that and check it out early in the day and then make a decision about which beach to go to. If we were going to St. Thomas in the winter, I think there would be some other choices to consider but summer in the Eastern Caribbean means it will be simpler and more relaxing to sit at the beach. 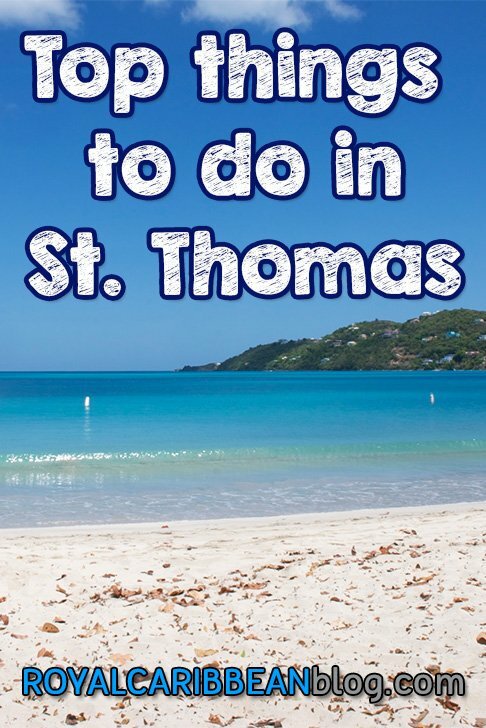 What would you do if you were going to St. Thomas? Share your thoughts in the comments!